The most common method for utilization of biogas in developing countries is for cooking and lighting, especially in rural areas. Conventional gas burners and gas lamps can easily be adjusted to biogas by changing the air to gas ratio. Burning biogas in a boiler is an established and reliable technology. Low demands are set on the biogas quality for this application. Pressure usually has to be around 8 to 25 mbar. Furthermore it is recommended to reduce the level of hydrogen sulphide to below 1 000 ppm, this allows to maintain the dew point around 150 °C. Biogas can be combusted directly to produce heat. In this case, there is no need to scrub the hydrogen sulphide in the biogas. Usually the process utilize dual-fuel burner and the conversion efficiency is 80 to 90%. The main components of the system are anaerobic digester, biogas holder, pressure switch, booster fan, solenoid valve, dual fuel burner and combustion air blower. Another common use is where the biogas powers an internal combustion gas engine in a Combined Heat and Power (CHP) unit to produce electricity and heat. 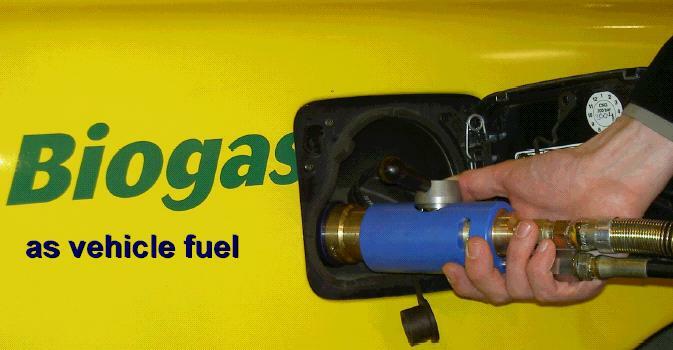 In Sweden the compressed gas is used as a vehicle fuel and there are a number of biogas filling stations for cars and buses. The gas can also be upgraded and used in gas supply networks. The use of biogas in solid oxide fuel cells is also being researched. The benefit of the process can be multiplied by the conversion of the effluent from the process into a valuable product. In order to improve the economical benefit of biogas production, the future trend will go to integrated concepts of different conversion processes, where biogas production will still be a significant part. In a so-called biorefinery concept, close to 100% of the biomass is converted into energy or valuable by-products, making the whole concept more economically profitable and increasing the value in terms of sustainability. Another example is the combination of biogas production from manure with manure separation into a liquid and a solid fraction for separation of nutrients. One of the most promising concepts is the treatment of the liquid fraction on the farm-site in a UASB reactor while the solid fraction is transported to the centralized biogas plant where wet-oxidation can be implemented to increase the biogas yield of the fiber fraction. Integration of the wet oxidation pre-treatment of the solid fraction leads to a high degradation efficiency of the lignocellulosic solid fraction.